Note: IMHO it would have been better … if her name had been Greta. Greta Kar-bo has a nice ring to it !! Stephenie Ma Kit-ting married Pui Wai-loi in Hong Kong; both 27 years old. They were among 1,017 pairs who got married on 11/11/2011 for its implication of "one life, one love". Considering some (or many?) marriages end up in divorce further down the years, the "implication" may prove to be only that … an implication. not particularly novel but phonetic-based (and propagates the stereotype that Orientals mispronounce their l's and r's). Nice going Professor Chan ! Over the decades, popular author and modern China historian Jung Chang, 61, has carved out her writing genre in striking fashion. Her recent photo is also striking and reminds me of an elegant, regal and extremely poised swan. 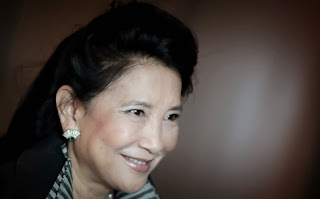 Jung Chang says she does not enjoy arguments, but the latest book from the writer whose works are banned in China is proving to be typically contentious. The Wild Swans author has offered a revisionist account of Empress Dowager Cixi, the concubine who ruled behind the scenes from 1861 until her death in 1908. A powerful figure who unofficially controlled the Manchu Qing Dynasty for nearly 50 years, Cixi governed during a tumultuous period in which she faced internal rebellions, war and foreign invasions. Cixi has since been portrayed as a cruel, hapless despot with an extravagant lifestyle, a conservative who suppressed reform in China for decades, who ordered the killing of reformists and put the emperor under house arrest for years until his death. Having scoured Chinese language archives in Beijing, Chang instead argues that Cixi was instead a reformer who laid the foundations for China to become the economic superpower of today. “I’m not one of those who relish a fight. I don’t enjoy it,” the 61-year-old author said in an interview. Empress Dowager Cixi - The Concubine Who Launched Modern China presents a figure whose leadership enabled the country to begin to “acquire virtually all the attributes of a modern state: railways, electricity, telegraph, telephones, Western medicine, a modern-style army and navy, and modern ways of conducting foreign trade and diplomacy. “The past hundred years have been most unfair to Cixi,” writes Chang. The Sichuan-born, London-based author says Cixi - and not reformist leader Deng Xiaoping who took power after the death of Mao Zedong - should be credited with launching the China of today. The book has received positive reviews, but critics have also cautioned against the level of Chang’s praise for a woman largely demonised by history. “Historical facts seem to have been used only when they were useful and tossed away when they contradict the main theme of her work; that the heretofore-vilified Cixi had been a brave and forward-thinking reformer,” read a comment piece published in the South China Morning Post recently. “It may be fashionable today to create a feminist heroine out of thin air, even if in fact there was none. Cixi was not a reformer”. Chang says she sought to provide the context for Cixi’s ruthlessness, which went as far as ordering the poisoning of her nephew and adopted son Emperor Guangxu, while on her own death bed. While Guangxu’s successor Pu Yi became Japan’s puppet-leader in Manchukuo, the state it established after invading Manchuria, Chang argues that the entire country would have eventually fallen to Japan had Cixi not ordered the death of Guangxu. The author admits that she did “develop sympathy” for Cixi, and some critics have accused the book of bordering on hagiography. Chang said she was drawn to the story of Cixi when researching her multi-million selling debut Wild Swans more than 20 years ago. “My grandmother had bound feet and I had been under the impression because of the propaganda that somehow foot binding was banned by the Communists,” said Chang. The book is the follow up to the explosive 2005 biography Mao: The Unknown Story which she co-authored with her husband Jon Halliday. It won praise for challenging perceptions of Mao, the founder of the People’s Republic of China who instigated the Cultural Revolution in 1966 and whose rule is estimated to have caused tens of millions of deaths through starvation, forced labour and executions. But it also faced strong academic criticism over its balance and scholarship. The author, who lost her father and grandfather to the Cultural Revolution, says such criticism is “totally unjust”. Along with 1991’s Wild Swans her study of Mao is banned in China. Chang says she is permitted to visit her elderly mother on the mainland on the condition that she does not speak to the press, at public gatherings or visit friends. As for whether or not her latest book will be banned, Chang says she expects sensitivity given what she sees as parallels between Cixi and a modern leadership looking to calibrate the pace of change in order to maintain control. “In both cases there have been decades of economic development,” said Chang.